William Corgel is a clairvoyant medium who is hubris, doubts his faith and a heavy drinker who finds comfort in pills. Believing there is nothing he can’t handle he soon finds himself in a home with a demonic presence and the possession of a teenage girl.The demon continually taunts and attacks him while claiming to know William’s suppressed childhood memory centered on his mother. 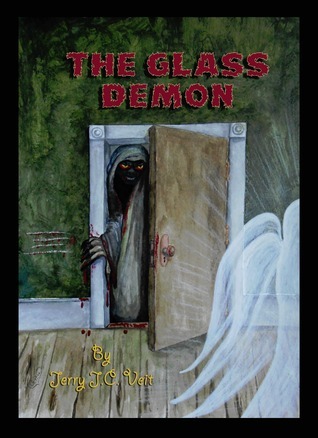 The Glass Demon is a supernatural novel that dives into the world of spirits and haunting’s. Why was this an important book for you to write? I was really into a TV documentary program called, A Haunting. It was about real life hauntings told by the people who lived through them. My goal was to make a fictional story that felt real enough that it could be believed to be based on a true story. I also had just watched The Rite with Anthony Hopkins. I knew I needed to write something that was super intense and scary. What I liked most about this book was the depth of knowledge of demonology presented in the story. What type of research did you have to do to keep things accurate? I have several books on true ghost stories and encyclopedias about the supernatural. One such book is: The Encyclopedia of Demons and Demonology by Rosemary Ellen Guiley. I own about 4 of her books. The encyclopedia has profiles on some infamous demons known to plague people’s sanity and also true stories about demonic occurrences. Additionally, I did a lot of internet research about demons, and books on demons, and types and names of demons. It was purely academic with a desire to entertain, but it made me feel like I was on the borderline to receive the wrath of God. Needless to say, research was extensive. William has had a complicated life. His avoidance of childhood demons leads him to an addiction to booze and pills. What was the inspiration for his character and backstory? Most heroes seem to be blessed with an infinite amount of strength, courage, and knowledge. My heroes tend to be flawed. William’s journey is meant to be a humbling one. He believes there is nothing he can’t handle; even though he never dealt with his own past. When he walks into this next case he is smug. He’s most likely thinking that he is going to walk around, find someone who doesn’t know he’s dead, tell him to move on, he moves on, William gets paid and then goes home. It turns out to be much more complicated than that. William is almost foolish in the beginning and doesn’t appear to be someone who can help the Glass family, let alone himself. He is on a slippery slope to self-destruction and then takes on the hardest haunting he has ever had; one that fights back. He’s also used to being the one who is in control. The fact that the demon knows William’s past and he does not takes the ball out of his court. He goes through an intense torture before he is finally able to become a hero and that’s only with the help of the supporting characters. Without them he would have failed. I also wanted to answer an age old question, why do bad things happen? William went through a lot of bad things, but in the end that is what he needed to become a better person. Most horror stories just want to shock and unnerve you, and the characters are all pawns who can die at any time. William brings a character-driven arc to the storyline that makes this a little more than just a horror story. Do you have another horror story in the works? Or are you currently working in a different genre? William Corgel is a clairvoyant medium who is hubris, doubts his faith and a heavy drinker who finds comfort in pills. Believing there is nothing he can’t handle he soon finds himself in a home with a demonic presence and the possession of a teenage girl. The demon continually taunts and attacks him while claiming to know William’s suppressed childhood memory centered on his mother. Capricorn follows Montague, a vigilante that delivers justice as he sees fit in a dystopian future where crime rules the city. What was your inspiration for this story and how did it develop as you were writing? Capricorn was based on a poem I wrote in my late teens. The poem was basically Montague’s entire monologue in the first few pages of his introduction when he is describing the city as a cancer. The character of Capricorn is purity, but with a childlike persona; which, when put into an adult woman, makes her appear to be crazy. Capricorn’s character is loosely based on Kai, who is kind of a strange, childlike girl in the PlayStation 3 game, Heavenly Sword. I had much of the dialogue previously planned out before writing and I knew how it was going to end. The hard part was trying to make it feel justified. Montague had to find internal resolution and defeat his own demons. That’s why his 7 trials had to take place. Montague is an intriguing character. I wasn’t able to pin down if he was an anti-hero or a good or bad guy, which was part of his appeal. What morals did you try to capture while developing his character? Montague is someone who has given up on humanity. Everyone is a villain in his eyes. He abandons his own name in an attempt to forget his former self and become something similar to the angel of death. His job, he gave himself, is to bring some sort of balance back to the world and to do so means killing everyone who is unjust; which seems to be mostly everyone. The only thing that makes him human is his compassion towards the innocents trapped in this city of violence. He saves a woman from being raped, but when a thief is murdered right in front of him he merely just walks over his dead body. He wants to protect good people, but at the same time believes there are no good people. This conflict puts him in a dark place. I felt the backdrop of the crime ridden city was vividly developed. What themes did you want to use while creating your backdrop? The main character of this story is the city itself. It’s tainted, dirty, rundown, and lying in ruins, but it remained this way because no one wanted to fix it. If you mixed the city in “The Book of Eli” and the city in “Judge Dredd” you would get the city in Capricorn. It’s a criminal’s paradise. It was never mentioned in the story, but you can almost imagine the sky being permanently overcast; it’s a type of hell and only Montague is fighting against it. What is the next book that you are working on and when can your fans expect it out? I’m a world builder. I put a lot of time into crafting the landscapes and populating them with life and a history. Even before I begin writing a story I come up with names of places and things or animals and peoples. That’s where I am now; writing pages and pages of notes which will eventually become appendices. They are developed mostly for me so I can keep track of everything; adding them into the book for the fans is just a byproduct of my writing process. In the aftermath of a civil war the city is in ruins and without order. Montague administers his idea of justice with his black steel sword until he discovers Capricorn. 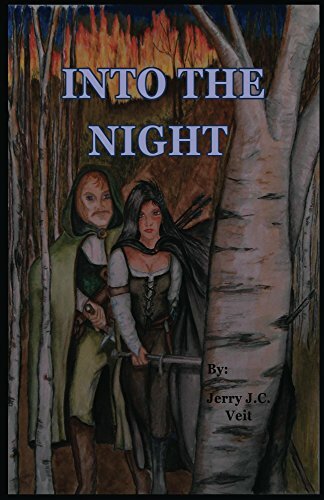 He becomes drawn to her and vows to protect her, but this is challenged when a group of thugs kidnap her. Montague is sent on a determined rescue mission, but in order to succeed he must battle the thugs of the city and their leader. Montague finds himself on a path of seven trials in order to gain entry into Mammon’s domain to save the one he loves. Capricorn by Jerry Veit is a pulpy thrill ride. 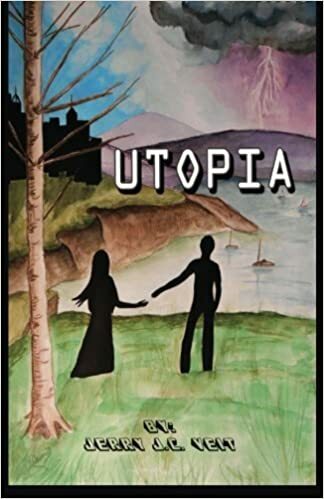 Set in a dystopian world where a city has fallen to criminals and other underworld scum, we follow the hero, Montague, who deals out his own brand of justice. A man who clearly has a dark past of his own struggles with his unrelenting anger until he meets Capricorn, a beautiful young woman. They instantly have a connection but their meeting is cut all too short when a group of thugs kidnap her. Montague is driven by his pledge to Capricorn and undergoes seven trials in order to enter Mammon’s domain wherein his love is imprisoned. The story is given in play format. The format does not detract from the story itself, although it would do well in audio format. The world of Capricorn is an interesting mix of fantasy, dystopian, and urban fantasy. There are even some themes and symbolism of classical mythology and the Judeo-Christian mythos thrown in for good measure. The world building itself walks a fine line of being just complex enough to make the world feel alive. Typical of Veit, Capricorn is a story driven by fast actions and passionate motivations. Montague is a not quite anti-hero, but embodies similar traits of the archetype, especially by how he deals out justice. He seems to sway back and forth over the line of being good or bad, although he bears everything that is thrown at him. The trails follow a somewhat formulaic method, but still give the reader certain checkpoints. This brings up the antagonist, who in some stories helps define the protagonist. Named the Demon, but later Mammon, Veit does some interesting things when the Demon clashes with Montague and it was these moments that will make the reader keep reading until the end. 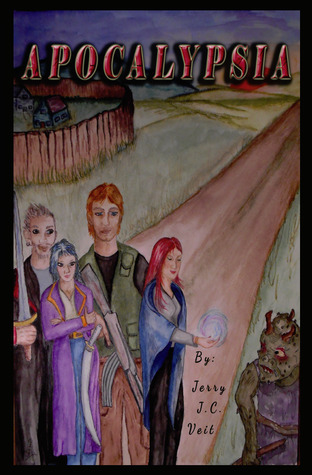 A traditional quest story set in a world that is so strange but familiar to us. Montague does seem to exist in a vacuum and does come across as too singularly minded, which tends to alienate the reader somewhat. This is circumvented by the pure romance and chemistry that Capricorn and Montague have for one another. The adventure, danger, and risk also keep this story lean and fast-paced. 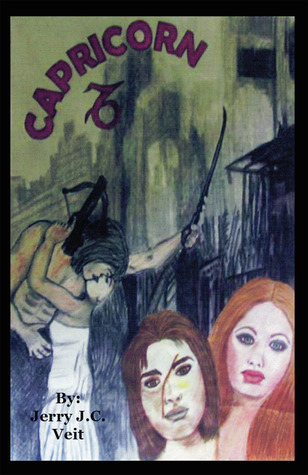 Overall, Capricorn is a fun read for more mature fans of pulp fantasy, urban fantasy and dystopian fiction. 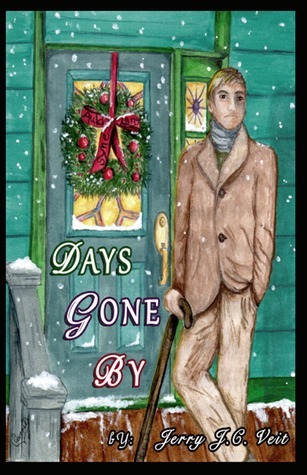 Days Gone By follows Caleb as he struggles with agoraphobia and the loss of his nephew in a car accident. What made you want to write a story about this topic? Anything pulled from your life experiences? There are a few things that are taken from my past. At the time of my writing Days Gone By my nephew was five years old. He is now seven and a joy to be around. No tragic car accident; however, I wanted to write a heartfelt, emotional, character-driven story and if I had to go through what Caleb did, I don’t know how I would deal with it, but hiding seemed like a safe choice; and that’s exactly what Caleb is doing. Many of Caleb’s visitors are based on real people in my life. His grandfather, for one, is based on my Mother’s father who did live in The Azores, Portugal. His story he shared about a possible angel telling him to return home due to a dangerous road ahead was true. Since he also lived so far away I did not see him that much and do wish I had more memories with him. Caleb’s Irish great, great, great grandmother is also mine from my father’s side who also emigrated to the U.S. from Cork, Ireland. Miss. Di Coco was my second grade teacher and Jessica was my real life childhood friend. To date all my books are adaptations from my screenplays. So they all share this style of writing. I also marketed it to a local theater to be a play, but my character list ended up being too long. The stories I’ve written before my scripts and now after will follow more traditional book layouts. Caleb’s has physical and psychological difficulties, but the spiritual burden of guilt for being the cause of his nephew’s death is overwhelming. What were the driving ideals behind the characters development throughout the story? I knew Caleb’s journey was going to be a hard one. Feeling sadness because of a tragic event is one thing, but Caleb is terrified of it. He’s afraid to feel that deep sorrow and face that reality. This fear became an illness that spread to all aspects of his life. He put up a wall to protect himself and now everything outside of his home and daily routine is scary. Three days after Christmas an auto accident left Caleb partially disabled and took the life of his five year old nephew. Now on the anniversary, four years later, Caleb is afraid to leave his house; even to attend his brother’s upcoming wedding. Soon past friends and deceased relatives mysteriously begin showing up in his home to deliver their messages and help him through his phobia by showing him glimpses of his past, present and possible future.